Tutte le foto che sono su valdallos.com non sono libri e sono la proprietà dell'ufficio del turismo du Val d'Allos. Tutti i contenuti e le informazioni presenti all'interno del sito sono protetti ai sensi delle normative sul diritto d'autore, pertanto nulla, neppure in parte, potrà essere copiato, modificato o rinvenduto per fini di lucro o per trarne qualsi vogli utilità. Tutti in contenuti sono forniti volontariamente per le varie prestatori e possono cambiare subito, in questo caso l'ufficio del turismo non puo essere risponsabile. - Any personal data collected on the site comes from the voluntary communication of an email address by sending a form. All email addresses thus collected are used only to send the requested information. - The email addresses collected will not be transferred to a third party or processed in any way by the tourist office of Val d'Allos. The tourist office of Val d'Allos does not use automated data collection processes (cookies, java applet or active X). - The French personal data act, of January 6th 1978, amended by the law dated August 6th 2004, defines guidelines for the automatic or manual processing or implementation of personal data or files. You have the right to access, modify, rectify and delete any information about yourself (art. 34 of the French personal data act). - Link from third party sites to https://www.valdallos.com authorises the creation of a hypertext link from any website, except those containing information that is controversial, pornographic, xenophobic or that may, more broadly speaking, cause offence to the general public. The link should direct to the site's home page and the site must appear in a new window. Site pages may not be incorporated within the pages of another site (Frame or iframe). Without specific authorisation that may be granted to individual cases, the deep-linking technique is not permitted. In all cases, the tourist office of Val d'Allos reserves the right to request removal of a link if it deems that the source site does not comply with the above rules. 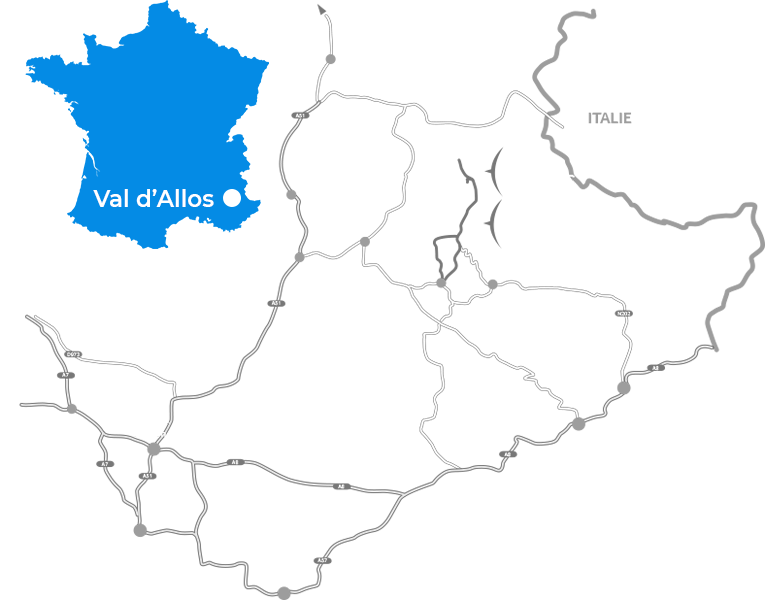 The tourist office of Val d'Allos reserves the right to "direct" to third party sites. Clicking on these links means that you leave the Val d'Allos site. Target sites are not under the control of the tourist office of Val d'Allos, therefore the latter cannot be held responsible for their content, any links they may contain or any changes or updates that may be made to them. Simply accessing the site does not give users the right to use it without consent from the tourist office of Val d'Allos. Permission to use the resources (photographs, pictures, text or form, format, structure, etc.) on the site must be requested beforehand from the tourist office of Val d'Allos. The tourist office of Val d'Allos grants authorisation to view the content of the site. The tourist office of Val d'Allos aims to optimise the accuracy of the information published, but cannot guarantee it or ensure its completeness. The tourist office of Val d'Allos reserves the right to modify all or part of the information contained in the pages of this web site at any time and without prior notification.